Yes, you. You decided. By voting. The ‘Gateway to Vision Research’ contacted MEPs from all member states on May 4th and May 5th 2009. We forwarded three questions in relation to the future of research and more specifically blindness and visual impairment in Europe. MEPs elected Jerzy Buzek to be the new European Parliament President with 555 votes in favour (or 86.18 per cent of the valid votes). He was elected after the first-round of voting. The 69-year-old Polish MEP will lead the European Parliament for two and a half years (until January 2012). 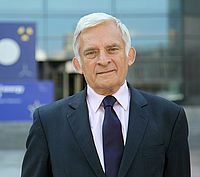 President Buzek is the first President of the European Parliament to come from Central and Eastern Europe following the EU's enlargement in 2004. Jerzy Buzek (EPP, Poland) replaces the outgoing President Hans-Gert Pöttering (EPP, Germany). Read the inaugural speech by Jerzy Buzek following his election as President of the European Parliament.